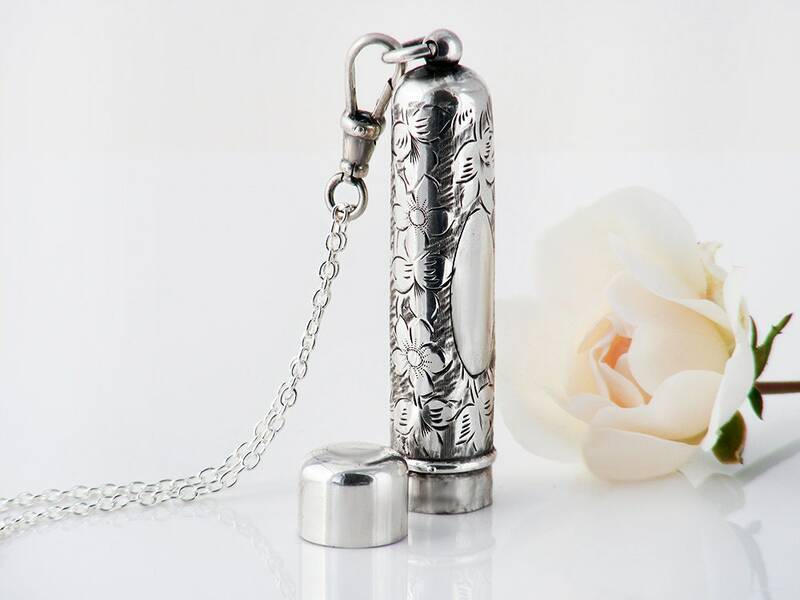 A very beautiful Edwardian sterling silver needle case originally made to attach to a chatelaine, this piece suits a long necklace chain beautifully. 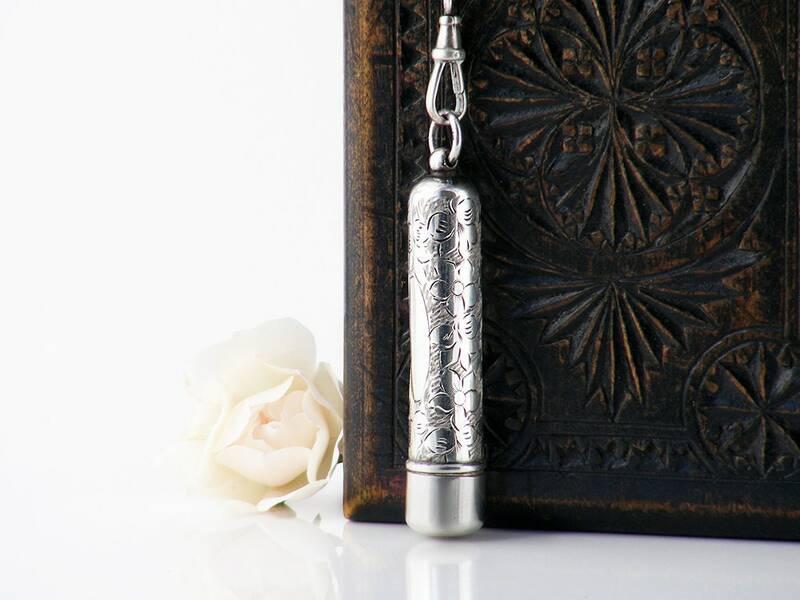 Expertly hand chased with Forget-Me-Not flowers, lovely to handle with a cap that fits perfectly - a secure place to carry a special note or token. An oval blank cartouche awaits that special initial. The case has full hallmarks for sterling silver, the assay office of Birmingham, England and the year 1915. The maker's mark 'F.W' for the renowned silversmith Francis Webb is also present. The large silver suspension ring carries the Lion Passant stamp for sterling. 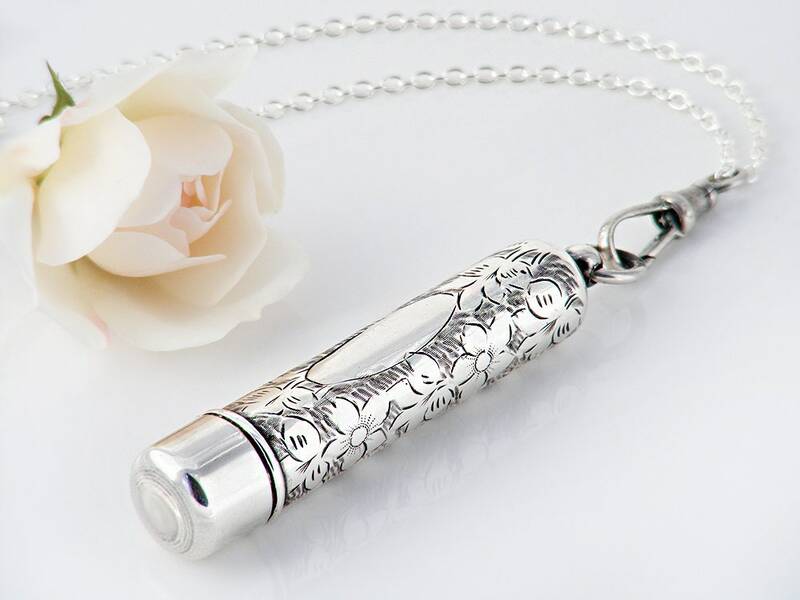 Size: 2.16 inches or 55mm long and tapering towards the lid/bottom edge which is 12mm or .5 inches diameter. The drop from the fob clip including the sterling ring is 2.67 inches or 68mm. Condition: Very, very good. There are no nasty scratches or dents, the top is snug and secure. The case is in great order for its age and the silver has lovely natural patina. 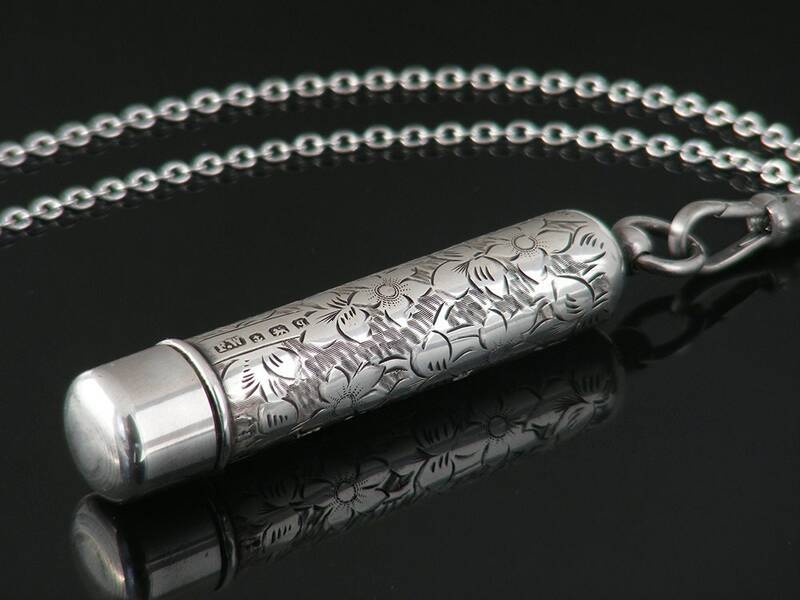 Presented on a new sterling silver chain, 30 inches or 76cm long, stamped to the clasp for 925 silver. 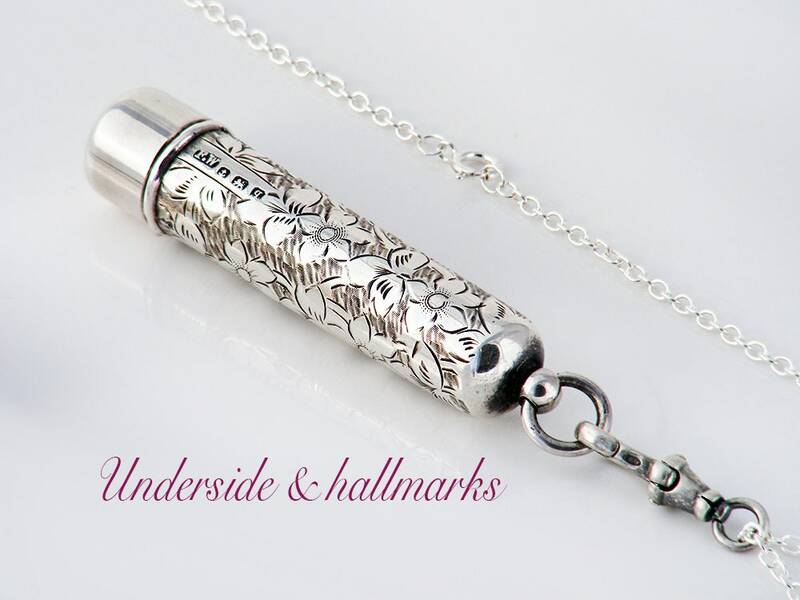 The fob clip is also new, antiqued 925 sterling silver and stamped as such. 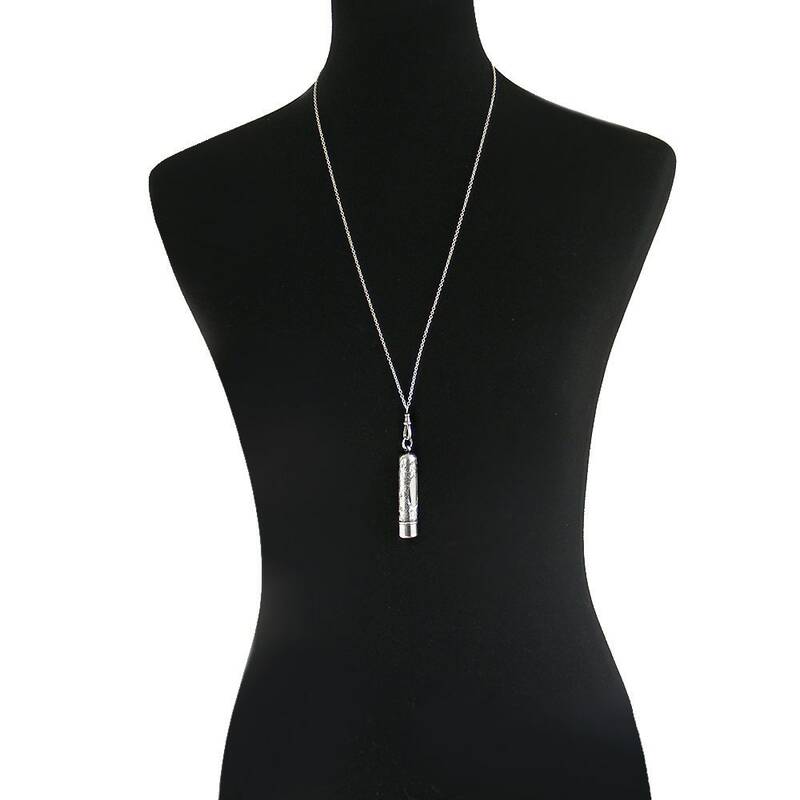 Shown on a life size torso in image #3, this is a very versatile chain and clip that can be used with other pendants. A wonderful find in such lovely order, beautiful to wear; a wonderful gift for a crafter, a lovely piece for a collector of Victoriana. WOW! This is the loveliest locket - more beautiful even than as it was described. Janne is meticulous in the presentation and speed of delivery. It's my 2nd order from ClosetGothic and I know I'll be back!! !